Players continue hockey skills here - All levels welcome. A Parent and Tot Hockey Program - Get on the ice with your little one for the first time and share their hockey experience - it could be parents, grandparents, a close friend or family member that attend with your little one. And maybe it’s your first hockey experience too! Each participant must have stick, helmet and skates. Full equipment is optional. Please note: Classes are adjusted to 40 minutes long for these sessions. A great way for a beginner/early years player to have a positive experience to develop their hockey skills! It’s never too late to learn the sport of hockey! We got you covered because MiniRinx is taught in small groups and you will be grouped with players of a similar level. Get on the ice with the kids or without - it’s up to you! 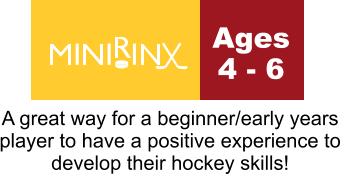 • All programs are taught in Minirinx circuit-style training with a maximum ratio of 1:5. Players learn in a small group for a highly interactive experience. Each group rotates to 5 different Mini ‘Rinks’ on the ice to learn hockey skills including: SHOOTING, PASSING, SKATING, STICK & PUCK HANDLING and SCRIMMAGE. All sessions are 50 minutes in length. • Participants are expected to have at least a small amount of skating experience and to wear full hockey equipment* (*except TOTZ ). 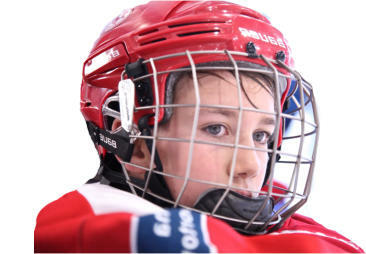 For a more detailed answer about the skating level required please see our FAQ’s or contact us and we would be happy to help. • Players are grouped according to skill level giving the player the confidence and ability to learn their skill but also the opportunity to progress and be challenged. Each station adjusts the drill for the player group so that is both appropriate for their level and fun. Questions? Call or email direct or check out our FAQ’s page. • All programs are taught in Minirinx circuit-style training with a maximum ratio of 1:5. Players learn in a small group for a highly interactive experi- ence. Each group rotates to 5 different Mini ‘Rinks’ on the ice to learn hockey skills including: SHOOTING, PASSING, SKATING, STICK & PUCK HANDLING and SCRIMMAGE. All ses- sions are 50 minutes in length. • Participants are expected to have at least a small amount of skating experience and to wear full hockey equipment* (*except TOTZ ). 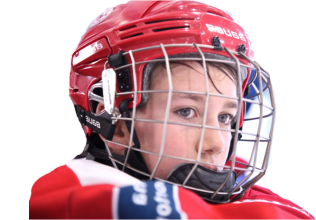 For a more detailed answer about the skating level required please see our FAQ’s or contact us and we would be happy to help. • Players are grouped according to skill level giving the player the confidence and ability to learn their skill but also the opportunity to progress and be challenged. Each station adjusts the drill for the player group so that is both appropriate for their level and fun. Questions? Call or email direct or check out our FAQ’s page.